Posted by Chris Fordyce. Jan 31, 2019. As you begin to set up your RosterElf account for your staff and business, you may have come across the ‘trends’ section on your dashboard. Only account owners and managers of your business will see this, and it is a valuable tool to have at your disposal. By accessing the drop-down menu of the ‘trends’ section, business owners and managers get a live view of the past business cost trends. Businesses can ill afford to blow over their human resources and payroll budget. This will upset a majority of staff who have been overworked or underworked to support their lives outside of work. Rostering via documents or spreadsheets fails to accurately track key business metrics such as labour costs, pay rates, and hours recorded. Managers always intend to create the lowest cost rosters and keep up with seasonal fluctuations. RosterElf incorporates a clever rostering trends section for business owners and managers to constantly review. This is available with both the basic and pro plans which owners elect to subscribe to. Roster trends display a 6-week business cost graph which outlines business spends for hours allocation, labour cost and what the average pay rate is for your published rosters. Hours represents the number of hours you publish rosters for each week. Here you can compare each weeks rostered hours to keep on target. Labour cost is the total cost of all your labour for the week and the amount you have paid staff each week. This is the average hourly pay rate you provide to your staff each week, which you can track against industry standards for your industry award. By staying on top of business costs, you can increase your budget in areas of your business that may require further attention and support. Roster trends play a big part in understanding your major business costs and keeping labour costs to a minimum. RosterElf provides access to business trends for owners and managers to compare week by week. 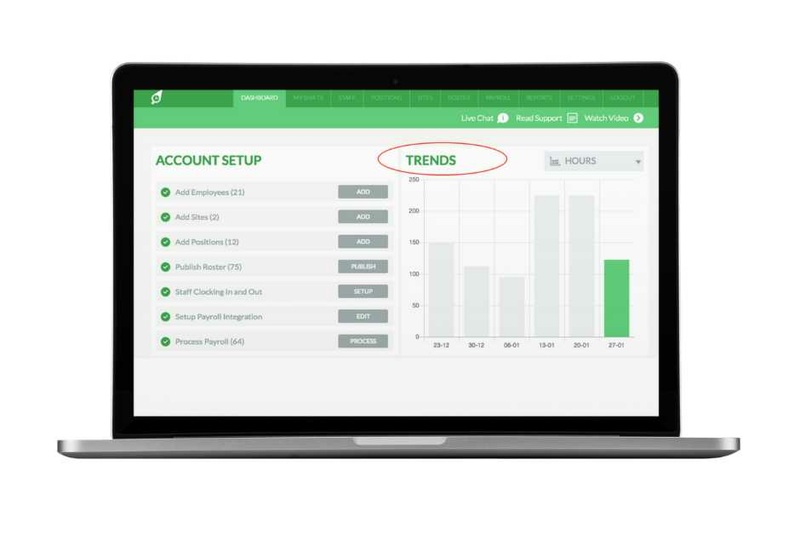 RosterElf recommends account owners and managers regularly check their business trends and track them against labour budgets. This will help manage labour costs and keep labour budgets to a minimum. Healthy businesses constantly review their budgets and costs, to ensure the business can grow and compete well in the marketplace. Successful business owners and managers should always stay up to date and be fully aware of all their business costs and look to invest in weaker areas of the business.